queenstown is a small town and therefore their winter festival was full of small town entertainment, including a dog-barking competition. if the hound wouldn't bark the owner had to get on the hay-bale, on all fours, and give a howl of his own. 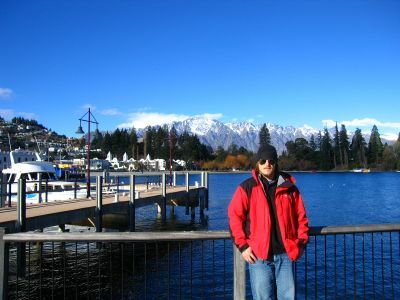 after two weeks of partying, i had to get out of queenstown. it's an awesome place but i'm pretty sure i was starting to die. 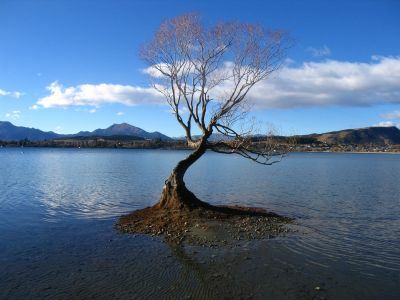 i took refuge about 75 km up the road in wanaka, where i did a lot of writing and took pictures of trees, like this one in lake wanaka. when i wasn't writing or taking pictures of trees, i was sitting by lake wanaka thinking about writing and taking pictures of trees. 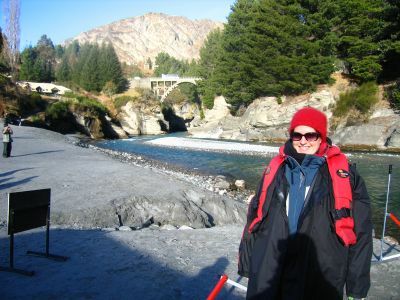 after about five days in wanaka, i headed to christchurch to meet mary from australia. she decided to pop over to new zealand for a couple weeks to save me from the trees who were forming an army against me. 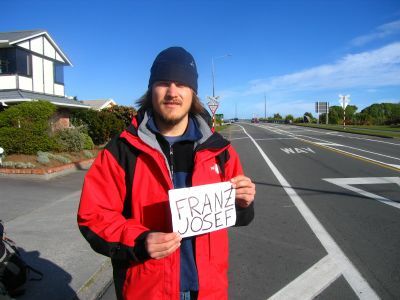 we hitchhiked all over new zealand, getting a ride from hanmer springs all the way back to wanaka (in bits and pieces), a journey of about 800 kilometers. a german girl picked us up outside hanmer springs. 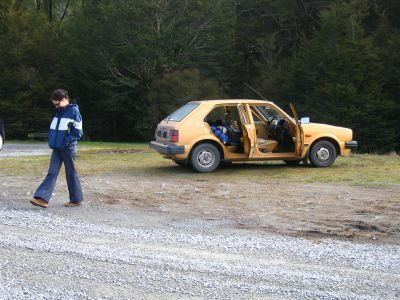 here is mary walking away from the car during a stop for photos. here's what we stopped to take pictures of. i like to hold a sign while hitching; mary doesn't, she's more old-school. either way, it worked well - we hitched everywhere. 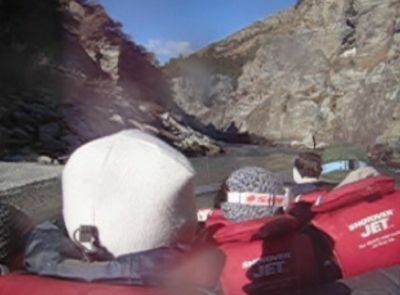 however, shortly after this picture was taken we were picked up by a murderer who killed us and left our bodies at the base of the franz josef glacier. actually we were picked up by a lovely mother and her seven year old daughter. those of you who are scared of hitching remember that the danger goes both ways: the person who picks you up could be a psycho but they have to be thinking that you could be a psycho too. i think the two offset each other. hitching is a safe sport, safer than walking across the street. and often times a local picks you up and teaches you things about the area. did you know that the town of reefton, new zealand was the first city in the southern hemisphere to have electricity? now where would you be without that knowledge, huh? 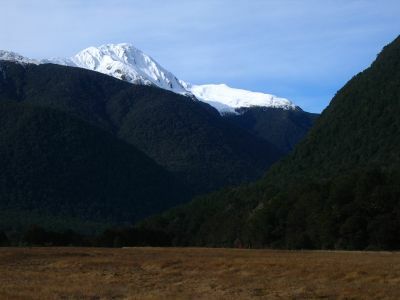 probably dead at the base of the franz josef glacier is my guess. get your thumb out there! the next thing i knew i was back in wanaka. only spent one night there though because the trees were closing in, ready to strike. i still have scars on my ankles from the grabbing branches as they tried to pull me into the forest. i escaped to...guess where? queenstown! for those of you keeping score at home this was my THIRD VISIT to queenstown on this trip. 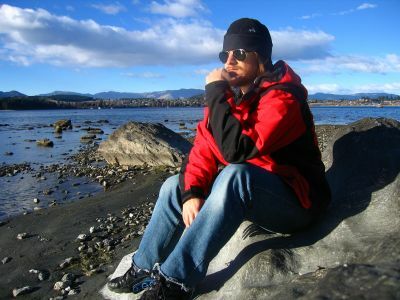 new zealand is a pretty small place so you tend to backtrack a lot during a long visit. 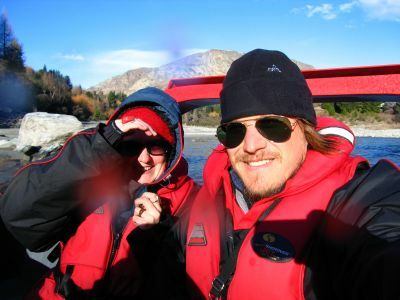 the first thing we did in queenstown was one of the only things i hadn't done yet: a jetboat ride. here is mary bundled up in all the clothes she had to stay warm on the ride. 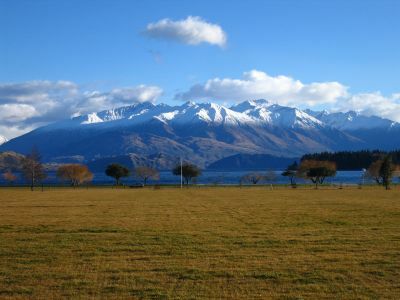 there is no off-season in new zealand. in the dead of winter they still race jetboats down the river. we climbed in. the kiwis invented, and perfected, jetboating. 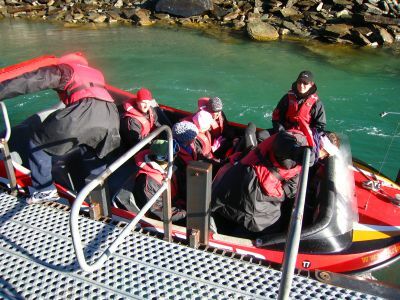 a jetboat is testament to the kiwi approach: extreme. some dude strapped a jet engine to the back of his boat once and jetboating was born. 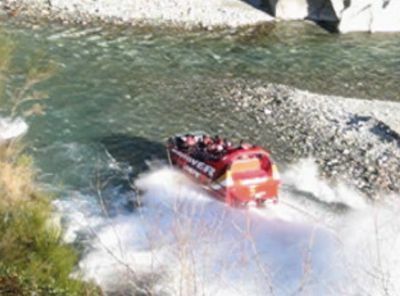 this red boat is called the shotover jet, which screams through the shotover canyon (where i had canyon swinged a few weeks back) down the kawarau river. nick, the driver, was insane, the first pre-requisite of the job. i could barely hang on but i managed to take a few shots while we thundered down the river. nick's main concern was going as fast as possible in the shallowest water and coming as close to the rocks as he could with the throttle pressed to the floor. it was especially nice when he'd look back to check our reaction, paying no attention to where we was going. this is what our boat looked like before disappearing into the canyon. we were all smiles at the end of the 25 minute thrill-ride.